Taking a trip with your Band? You need an iPad/iPhone app for that! 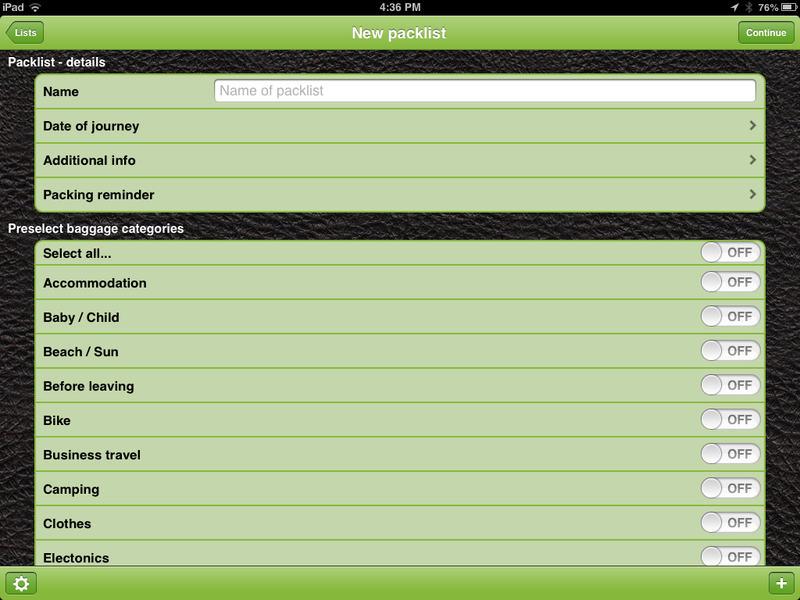 Use Pack The Bag App to Make Sure You Don’t Forget Anything! This blog post is being written because I like to keep lists of things that need to be packed for our band trips. Every year when I go to Band Camp I know I will need specific items, when we go on a marching band performance trip or go to band festival there is a different list for each trip. If myself and my students have a packing list to check things go much smoother! No longer do I have to call my wife from the band bus and ask her to bring me my scores that are sitting on my desk at the school! 3)Select baggage categories (TIP – Important:If you want to set up a new baggage category or get rid of the pre created ones, this is where you do it! Tap + button in bottom right corner to add a new category. Tap the Gear icon in the bottom left if you want to delete some of the existing categories. 4)After tapping the continue button then you select items from each category to add to you list. 5)After adding items to your list you will see a button with a 123 on it – this allows you to set a predetermined number that you want to pack for an item. Tap the 123 button, type in a number of items and then DO NOT TAP THE DONE or OK BUTTONS! tap anywhere else! Stupid I know – this has to be a bug. TIP – Important: If you want to edit the items in these categories this is the screen you do it on. Tap the gear icon in the bottom left of the screen and all items will be editable! Change the names, delete and sort them. Tap the + button in the bottom right to add an item – CAUTION: When adding items I would suggest using the add in alphabetical order option – It becomes a jumbled mess real quick when creating a brand new category! 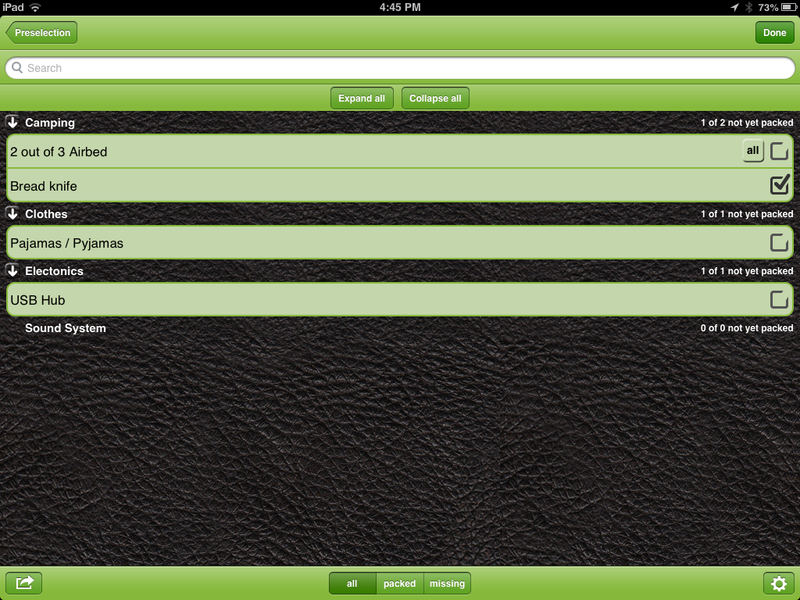 Also on this screen is where you see the Share button in the bottom left – this allows you to send and export your list. One option I appreciate here is being able to export to DropBox – This allows me to create lists on my iPad but use my iPhone to mark things packed. It is much easier to carry my phone around while packing then it is to carry my iPad! THAT’S IT YOU’RE DONE – Ready to go to Band Camp or to Choir Festival or on Tour! I have my student leaders download this app as well because I share the list that I have created and let them do the packing! NOW – Share with me….. if you have a packing list app that you like please leave a comment below and let me know what it is!